I don't like the doors in our home. But, when you rent there's not much that you are able to change and we don't want to invest too much into it either. While I would love to swap out our plain doors for two panel, that's out of the question. 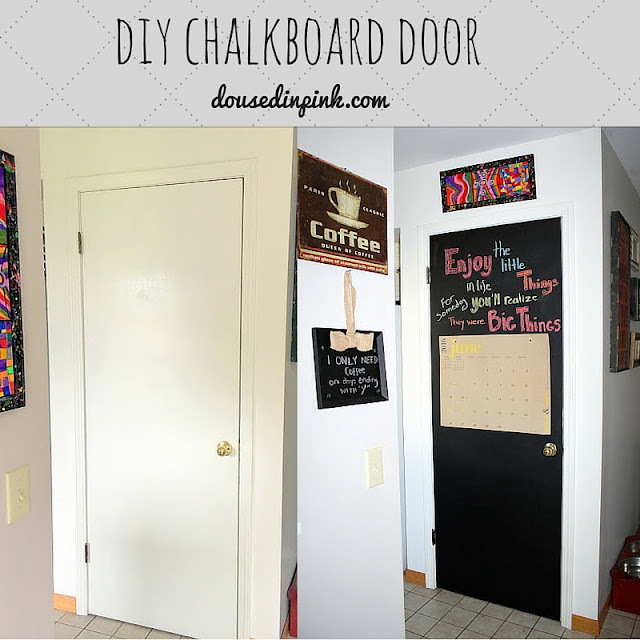 My Mom has a chalkboard door leading from her kitchen to garage and I decided that I wanted one too. The door leading from our kitchen to the basement was the perfect door to paint. It would add some fun to our kitchen and would be a great place to write grocery lists, meal plans, to-do's and inspirational quotes. Wash the door surface with soap and water. Allow to dry. Tape door frame and handle with painters tape. Evenly apply 2-3 coats of chalkboard paint. Allow to dry in between coats. Use the foam brush to paint around the edges, hinges and door handle. Once dry you have to season your board before you can write or draw on it. Using the side of a piece of chalk, rub the entire surface horizontally. Then wipe off with a soft cloth. That's it - it's seasoned and ready to use! This was also a good spot for our family calendar. I transfer everything from our google calendar here so I have a visual of the month. What do you think? I love how it turned out and that it adds some interest to this space. Click here to enter my giveaway for DevaCurl products!